18+. News customers only. Wagering requirement: 35x; Minimum deposit: €10. Bonus expires in 30 days. T&Cs apply. ComeOn! Casino is a refreshing contributor to the online gaming palette, with a no-fuss approach and modern concept. Launched in 2008, this destination built a core user-base, who choose them for their diverse selection of games and friendly attitude. ComeOn! Casino works with the industry’s most acclaimed developers such as NetEnt, Playtech and Play’n Go, which is already a promising element. With a modern and laid-back design, ComeOn! Casino strikes as a really inviting and secure place to play. Looking at their security measures and discourse style, the above statement proves true. ComeOn! Casino omits the usage of fancy words and formalities, since the staff is aware that most players are non-native English speakers. It may come off sniffy, but once you get to experience the ComeOn! Casino mood, you’ll know it comes from genuine caring and attention to customers. The registration process is really simple, an attribute that’s noticeable on the execution of the whole site. The menus are customizable, meaning that you can merge your favorite categories to access your favorites and nothing else. There are many payment and withdrawal methods available and you can use 13 currencies to deal with the finances. The language variety covers all the widespread languages but you might not even need to change the automatic English. Game wise ComeOn! Casino offers all the basics and more with their Special Games and Scratch Tickets collection. Blackjack players can choose from eight online blackjack titles or a Live Blackjack option. You’ll also find the newest slots, video poker games or sportsbetting opportunities. The ComeOn! 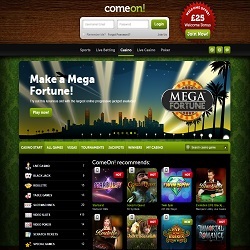 Mobile Casino provides a reduced catalogue, bringing nearly 200 games to the table. The one field where ComeOn! Casino disappointed is promotions. Don’t get us wrong, it’s not that they aren’t good, only that we had high expectations after all the brilliance. There’s a 100% up to €25 Welcome bonus to greet new players. Furthermore, there are countless tournaments for slots and a player reward system that looks really profitable and fun. Overall, ComeOn! Casino deserves a really high rating from us. This destination provides almost everything that we’re looking for in an online casino. ComeOn! Casino runs on the software of NetEnt, which will always count as a good sign. NetEnt is one of the most recognizable brands in the industry and their services and games are trusted by millions. Yet, ComeOn! Casino included some other developers in their selection from the likes of Microgaming, Playech, Play’n Go and Evolution Gaming. We might conclude that ComeOn! Casino has a diverse catalogue of games from the mammoths that define the online gaming landscape. Let’s take a look at ComeOn! Casino ’s blackjack menu. Most importantly, they offer eight titles, which – without an exception – are on a high level when it comes to graphics and quality. Namely they are Blackjack Pro, Blackjack, Blackjack Single, Blackjack Double Exposure, Blackjack Retro, Blackjack Surrender, Perfect Blackjack and Blackjack Twist. From these, the first four variants allow three stake levels: low, medium and high. Blackjack Retro is as traditional as it gets and it’s not an easily found type. 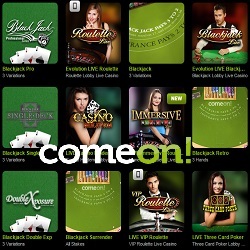 Even though the blackjack selection is not the most wide-ranging it is suitable to satisfy the average player’s needs. In addition, you can just click over to the Live Casino lobby for the most authentic blackjack game-play online. The other games category is the weakness of most online casinos. Therefore, it was relieving to see that ComeOn! Casino placed 12 titles in their Special Games menu and five options to their Scratch Tickets selection. At Special Games you’ll find games like Derby, Bonus Cards, Penalty Shootout, Greyhounds Park or Instant Lotto. Some of these have a steady player base, so it’s a definite plus that ComeOn! Casino thought of them. With the constantly growing popularity of scratchcards it’s understandable that a forward-thinking destination would include some great choices. You can choose from Bingo Scratch, Triple Wins, Scratch Ahoy, Lucky Double and Star Ticket. Altogether, ComeOn! Casino performed really well at this field too. Right after the registration at ComeOn! Casino you can claim a 100% up to €25 Welcome Bonus. Their Player Points systems ensures many additional bonuses during your membership. If you’re into slot tournaments, check out their schedule for the newest events with the biggest rewards. ComeOn! 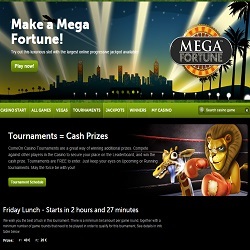 Casino merges everything that is likeable at an online casino destination. Wide game selection, excellent security and friendly atmosphere awaits to every player that chooses to join them. Plus, with their great mobile site, you can play anywhere and anytime. It’s definitely recommended to take a chance with ComeOn! Casino . If you’re into live games, ComeOn! Casino is an ideal place to engage in your favorites. Their collection is not yaw-dropping but it covers all the essentials. You can choose from classic Roulette, Blackjack, Holdem, Immersive Roulette, VIP Roulette, Three Card Poker and Baccarat. Their catalogue is constantly growing, so it’s worthy to check it from time to time. The titles were crafted by the most competent developers, so the quality is not in question. Moreover, the cool atmosphere of this online casino adds a lot to the experience. Just type in the ComeOn! Casino ’s URL into your mobile browser and you’ll be redirected to their mobile-optimized website. It’s easy to use on touchscreens and there are almost 200 games to choose from at the casino lobby. Slots, Poker, Roulette and most importantly Blackjack are the available categories. Besides these, you can bet on sports which is another service of ComeOn! Casino . Unfortunately, there are only three blackjack titles on offer – European Blackjack, Blackjack PRO and Classic Blackjack Gold. We’d be happier with some more variants, but as a starting point they will do.